These are ongoing leaks of natural gas in the Westwood area. They are reported, as required by law, by Eversource, the local utility, to Massachusetts government authorities, along with an indication of Eversource’s estimate of the severity of the leak. All that’s been done here is to display these locations on a Google map, something anyone could do at any time. There is, apparently, no urgency on the part of the utility to fix these, something which gives pause to those of us who consider fugitive emissions of this methane to be both a threat to climate and to public safety. Moreover, suppliers of natural gas to utilities like Eversource and National Grid, are going crazy building additional transmission lines. National Grid is intending to increase pressure for delivery in these lines which, naturally, will make the leaking worse. Apparently, the quarterly profitability of utilities and natural gas suppliers allows the construction of new pipelines, paid, as it is by ratepayers, but not the repair of existing pipelines, which may not be. Natural gas: Not clean. Not cheap. A bridge to nowhere. Dangerous to your family and to the environment. Ditch natural gas. Switch to solar energy. This can be found online. 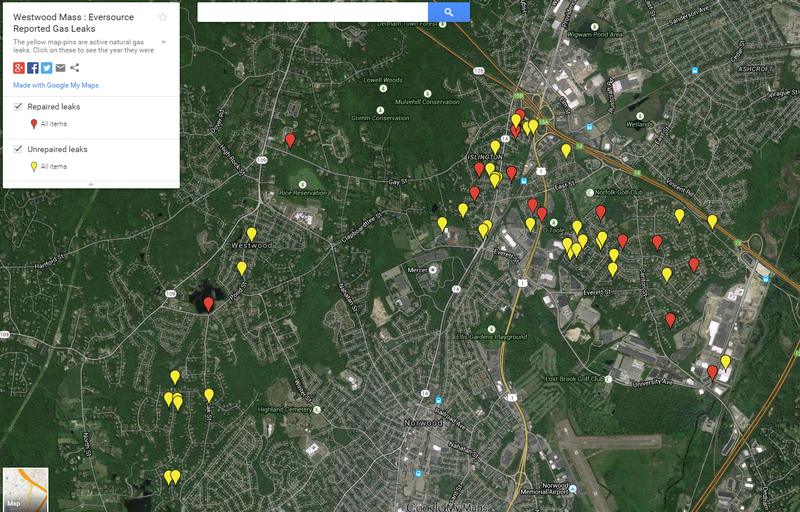 And you can check the status of your community in Massachusetts yourself. There has been news coverage. This entry was posted in bridge to nowhere, carbon dioxide, climate, climate change, climate data, climate disruption, conservation, consumption, ecology, energy reduction, energy utilities, environment, fossil fuels, fracking, global warming, investment in wind and solar energy, meteorology, methane, natural gas, open data, pipelines, politics, public utility commissions, PUCs, rationality, reasonableness, risk, spatial statistics, sustainability, the right to know, zero carbon. Bookmark the permalink.